Kip Moore's breakthrough single "Somethin' 'Bout A Truck" recently crossed the Gold sales mark, the first new artist of 2012 to do so, and now he is releasing this debut for MCA Records. Read on to see what we have to say about "Up All Night" here! Kip Moore is yet another artist who got his foot in the door by writing for someone else. Specifically, he penned "All the Way" and "Let's Fight" on Thompson Square's debut album before making his first appearance with "Mary Was the Marrying Kind." Although this song fell short of the top 40 (and it doesn't appear on this album unless you buy the deluxe edition from iTunes), Kip and MCA Nashville quickly called a mulligan. And not unlike the aforementioned Thompson Square with "Are You Gonna Kiss Me or Not," Kip's second single ("Somethin' 'bout a Truck") has taken off. "Drive Me Crazy," co-written by Kiefer Thompson, is a typical teenage romance story from the male perspective, standing out with vivid lyrics such as "The moonlight was all around / Our breath, the only sound." When the daddy's job takes the girl away, Moore sounds like he's truly torn up over what he can no longer have. Later on, he covers the same territory with "Crazy One More Time," which ends with him singing "I guess I'll always have this longing in my heart" over a driving groove after recalling one last make-out with a girl whom he'll never see again. Later on, you might find "Where You Are Tonight," where he's wondering just that. Despite its weak chorus, this song is otherwise a solid, passionate look at missing someone. That song and "Beer Money" were both co-written by Blair Daly and Troy Verges, both of whom turn in something other than crossover-friendly pop ballads for once. On "Beer Money," Kip invites a girl who's feeling down to go off and drink those troubles away while he pays. The synthesized hand claps and snappy melody are set to interesting lyrics such as "Hope we get lucky and stay out of jail" and something I'm always a sucker for, a really long chorus á la "Somewhere with You." 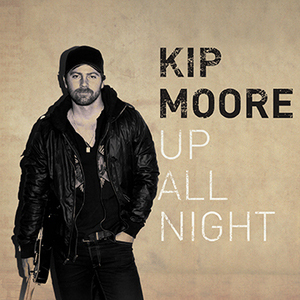 In a similar vein, the title track has Kip offering his sweetie (and her friends) the idea to "take the only road straight out of town" and stay up all night dancing and partying. "Truck" is parked in the third slot on this album. It has a very interesting structure — four verses all beginning an ending with "Somethin' 'bout a _____" followed by a chorus that puts them all together in rapid-fire fashion ("Somethin' 'bout a truck in a field and a girl in a red sundress with an ice cold beer to her lips / Beggin' for another kiss"). Clever, catchy and radio-friendly all at once, it has the obvious markings of a hit. After three up-tempos, "Everything but You" comes along to lead off the ballad-heavy midsection. "I finally found the place / Where I can start to plant some roots," Kip sings, soon adding "It's got everything but you." He then elaborates on what a great place it is with its taco stand that serves beer, pathway to the ocean, shining sun, an old man who makes good wine. I would be surprised if this isn't a future single. "Truck" co-writer Dan Couch contributes to three other tracks. "Hey Pretty Girl" is similarly tight in its structure, each line bookended by some phrase starting and ending with the title. Kip's voice pushes down to its lowest as he follows the obvious path from "look my way" to having a dance to taking her home to starting a family to death. After it is "Reckless," which recalls a life story of being a rebellious teen, wanting to change his life but getting fired for various reasons such as smoking pot on the job. "Maybe I'm way too much about havin' fun," he sings with an obvious smile on his face, making it clear that the song is tongue in cheek. The song then takes a more serious sound when he recalls getting a gig at a bar, being spotted by a record exec who wants to meddle with his image, then telling said exec to shove it. It's a surprising "take that" for a newcomer to make, but a credible one. Couch's fourth co-write is "Fly Again," a midtempo about going off to forget about a lover while getting lost in smoke and drink. The melody is a bit monotonous, but elevated by Kip's voice. "Faith When I Fall" starts off with acoustic guitar before building to an electric guitar-and-drum loop arrangement. Pleading for strength, guidance and faith, he admits that he's been a stranger to God but still wants to change that. This kind of song has been done so many times before, but the grain in Kip's voice adds weight and credibility to his pleas. Although Kip Moore touches on so many country cornerstones — drinking, smoking, trucks, hot girls — he does so in a believable fashion. His voice has a balance of gruffness and tenderness that reminds me of David Lee Murphy, with whom he also shares a knack for solid melodies and detail. Lee Brice is also an obvious point of reference for his grit and lyrical skill. Moore has more of a rock edge to him, thanks in no small part to Brett James' muscular production. Instead of being compressed into a tinny, bombastic wall of sound á la Frank Liddell, there is a definite variety in dynamics. The guitars ring out and crunch, the drums (or drum loops) and bass are clearly audible, and Kip is never overpowered by the instruments. Overall, Up All Night gets absolutely everything right, as a debut album should.